Building an outdoor horse arena — whether it’s for equestrian training purposes or simply for your leisurely hobbies — can be a costly endeavor. That’s why it’s important to know how to properly build — and perhaps more importantly, stabilize — your outdoor equestrian and/or riding arena to ensure that simple mistakes won’t be made. 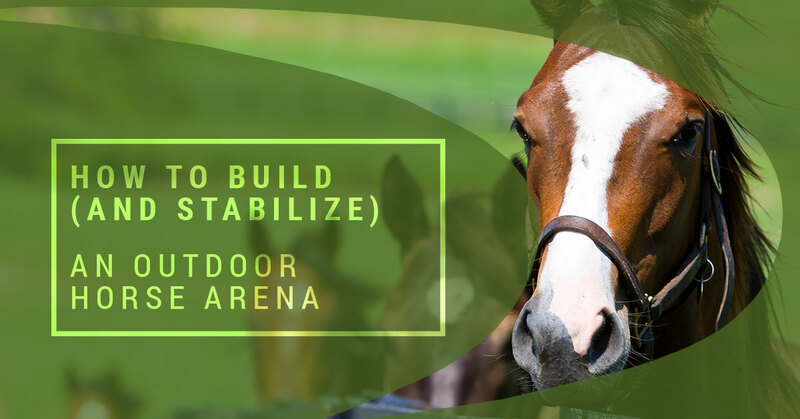 Before you develop your blueprint and get to work, be sure to read our blog for tips on how to build and stabilize an outdoor horse arena the right way. That way, you can save money and ride comfortably for years to come. In this blog, we’ll go over planning, tips, the ins and outs of horse arena construction, and the best methods for permeable ground stabilization in your equestrian arena. Ready to get started? Then climb on up into the saddle and join us for the ride of a lifetime. Let’s build an equestrian arena! The first thing to consider when building an outdoor horse arena is the location. What is the best spot for your riding area? There are several factors to consider here, not the least of which is the ground you are going to be working with during construction. Drainage ability is key when choosing a spot for your arena, as it is going to be imperative that your arena is constructed in a place where water can freely flow away from the grounds in the event of rain or other elements. Consider choosing a high point on your property, with soil that is conducive to draining and/or absorbing water quickly. The last thing you want to do is build an arena in an area that is susceptible to floods — causing large puddles of water, mud, and further damage that may cause you to rebuild elsewhere. Before you begin hauling the materials for the fence, top layer, and other aspects of the arena, it’s important that you understand everything about your chosen location’s ground base. As we touched on above, having a reliable drainage system is going to be imperative for your safety and the safety of your horses. Not to mention, the drainability is going to go a long way toward the sustainability of your arena. You want to avoid running into a situation where erosion or poor drainage creates puddles, holes, and other headaches both now and in the future. That’s why the base layer needs to be constructed in a way that is permeable yet stable, protecting the area from erosion and other natural effects — along with the heavy foot and hoof traffic the area will experience over the coming years. When it comes to permeable ground stabilization for equestrian arenas, Ecoraster geogrid solutions provide the reinforcement you need. Built to protect against erosion while also providing an insulating sub-base layer to remove mud and provide efficient drainage, the Ecoraster products are designed to help create sustainable, eco-friendly equestrian arenas for the future. Learn more about Ecoraster products and contact B8 Ventures today. The top layer is the final, and arguably one of the most critical, components of any outdoor equestrian arena. What you want is something that is going to be soft and cushiony, yet durable enough to provide a steady surface that won’t sink. Whether you choose sand, gravel, or a commercially made product, it’s important to know the pros and cons of your top layer before you fill the entire arena. Keep in mind that the work is not over once your equestrian arena has been built. It’s important to provide routine maintenance and upkeep in order to keep your arena, and more importantly your horses, safe. Ready to get the permeable ground stabilization units you can count on? Visit B8 Ventures to place an order in Canada today.